Upon general request, Epiphone reissues the G-1275 Doubleneck guitar, a limited edition that is exposed at Musikmesse 2014. Dean Guitars launches in 2013 a new version of the double-neck guitar VMNT Dave Mustaine signature with a custom graphic Diadem finish. Thanks to DJ Scully for the presentation of the new Vigier guitars at NAMM 2013, including the DoubleBfoot and its metal fingerboard. The french luthier Vigier exhibits at NAMM 2013 four new electric guitars, including a double neck and a limited edition. Veillette Guitars introduce a new approach for the doubleneck guitar. Manne has released the list of its new models produced in the last month. B.C. 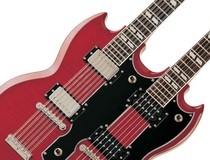 Rich Guitars has announced the Double Neck Bich electric guitar as a standard production model in 2009.